Dutch M 1875 Model No.1 Mastersword. Excellent long straight double edged bright blade with ritch etching. Excellent gilt brass lion head pommel and single hand guard. This one has red ruby glass eyes laid in the lions head, which is very unusual! Gilt brass crossguard with straight quillon with acorn final. Gilt brass clamshell with silver emblem laid over red vilt showing a shield with two crossed swords above a laurel wreath. Black horn grip with intact silver wire winding. Very good black leather scabbard with tooling and a brass chape and top mount with a round frog stud and one loose hanging ring. All stitches intact and no dents to the mounts. This example did belong to a Master and not a so called; Prevot. A rank lower than master. Masters wear a different silver emblem with a laurel wreath on the clamshell under the crossed swords.The laural wreath is not on the emblem of a prevot. This elegant sword was very popular at the Dutch Royal Militairy Academy (KMA) in Breda and till 1914 by NCO's of the Jager and Grenadier Regiments. Present day, at the KMA the old tradition of becomming a master is back again, and an aspirant officer gets a mastersword after becoming a master on one of the three weapons: Rifle, sword or spadroon. 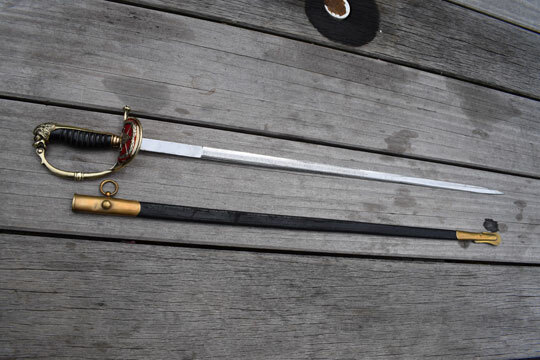 These antique swords come out of the inventory of the Academy and stay property of the Academy. When the officer leaves the Academy he is not allowed the keep the sword anymore as it was in the old days.